The Kuuk Hand Powered Food Processor is made from high-grade, food-safe plastic and comes with four separate functions. You can spin vegetables to dry them, chop them, or mix different vegetables together-all using the same simple mechanism. As a bonus feature, the food processor also includes the ability to separate eggs! 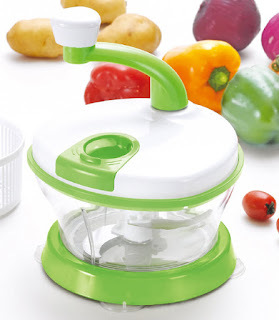 My favorite feature is the suction base with holds this food chopper securely to a flat surface as you work. This kitchen must is perfect for the medium size jobs that do not warrant your full-size electric food processor. Since it is hand powered, there is no need for outlets nor batteries - excellent for outdoor activities like camping or tailgating! Tip: Everything comes apart for easy washing and is also dishwasher safe. Quickly whip up a salad or easily prepare the vegetables for your dish with the hand powered food processor from Kuuk. This appliance makes cooking with veggies a breeze and will quickly become one of your favorites. 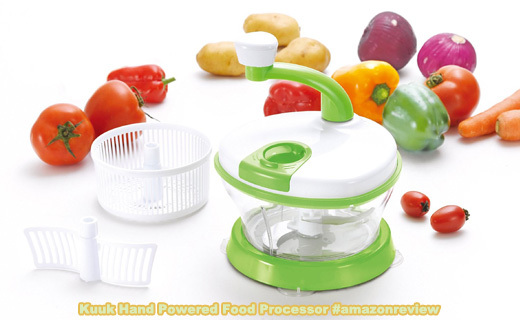 With the Kuuk hand food processor you can spin vegetables to dry them, chop them, or mix different vegetables together-all using the same simple mechanism. As a bonus feature, the food processor also includes the ability to separate eggs. You can use this hand powered food chopper by following three simple steps. First, lock the suction base down onto a flat surface. Then insert the plastic cup, lock it in place by turning clockwise, and place your accessory of choice in the centre of the cup. Now rotate the crank to dry, chop or mix your vegetables. It really is that easy! Forget about replacing batteries, tangled wires, or the risk of electric shock with wet hands in the kitchen. The Kuuk manual food processor is operated entirely by hand, making it a safe choice for you or anyone in your family to use. Prepare salad, salsa, eggs and more... risk-free. The Kuuk hand food chopper is dishwasher safe and cleans easily by hand in the sink. Unfortunately, the same can't be said for large, heavy, awkward electronic appliances. What's more, this product is made from high-grade, food-safe plastic only, so there' s no risk of contamination either way you clean it. • Completely hand-powered-no batteries or electricity required!